At the rally of thousands in Mersin on March 10, Turkish President Recep Tayyip Erdoğan welcomed his supporters with the hand sign of the extreme right-wing terrorist organization Bozkurtlar (Grey Wolves), Rossa Primavera News Agency correspondent reports. The Justice and Development Party led by Recep Erdoğan held a provincial congress in Mersin. Prior to the official meeting with party members, the leader of Turkey took part in the rally, which gathered residents of the city. 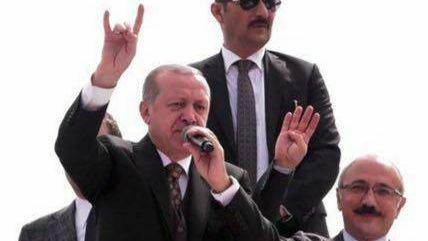 At the rally, the president raised his right hand with fingers folded up in a sign similar to the salutation sign of the Bozkurtlar members (Turkish youth organization of the extreme right-wing nationalists Grey Wolves). The organization of Grey Wolves was established in the late 1960s and is the most radical wing of the Nationalist Movement Party. The doctrine of Grey wolves has a clear neo-fascist character. Members of the organization are actively involved in political violence. Bozkurtlar were linked to the international terrorist system of Gladio, which has close contacts with the CIA. The militants became came into the world’s spotlight after the organization of unsuccessful assassination attempt on the Pope John Paul II in 1981. Since the beginning of the 2000s the Grey Wolves officially are allegedly in opposition to Erdoğan’s Islamist party. On November 24, 2015, near the Syrian-Turkish border Turkish fighter F-16C shot down a Russian Air Force front-line bomber Su-24M, which belonged to the Russian aviation group in Syria. The crew of the plane catapulted, but the commander of the crew Oleg Peshkov while landing with the parachute was shot by terrorists. Among the militants who killed the Russian pilot, was a Turk, Alpaslan Çelik, the son of the former mayor of Keban in Elâzığ province. Alpaslan Çelik is a member of the Grey Wolves. The incident with the downed plane and the murder of the pilot seriously strained Russian-Turkish relations. This entry was posted in News from the Middle East and tagged Informational-Psychological War, Turkey. Bookmark the permalink.